A Year of Being Here: Gary Lawless: "Treat Each Bear"
Treat each bear as the last bear. Each wolf the last, each caribou. Each track the last track. "Treat Each Bear" by Gary Lawless, from The Dire Elegies: 59 Poets on Endangered Species of North America, edited by Karla Linn Merrifield and Roger M. Weir. © Foothills Publishing, 2006. 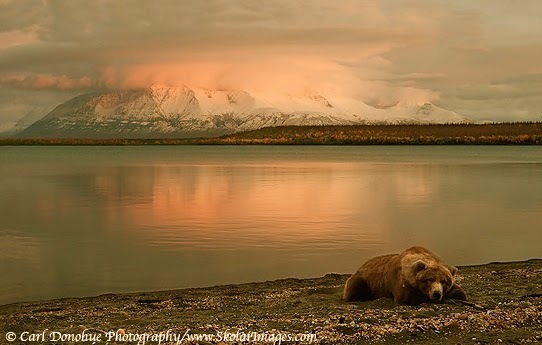 Art credit: "Grizzly Bear at Sunset," photograph by © Carl Donohue Photography (originally color). Thank you for this wonderful comment. Here's to the freedom of Gemma and the life of all the animals with whom we share this good Earth.